As the November launch date for the XO approaches, the news, save for the price, keeps getting better. The XO, as regular reader of this nanocorner of the ‘Sphere© no doubt recalls (and such links as this, this and this will help jog the memory), is the long-awaited One Laptop Per Child initiative of Nicholas Negroponte come to fruition. And now, the respected David Pogue of the NYTimes weighs in with his advance report. The truth is, the XO laptop, now in final testing, is absolutely amazing, and in my limited tests, a total kid magnet. Both the hardware and the software exhibit breakthrough after breakthrough — some of them not available on any other laptop, for $400 or $4,000. In November, you’ll be able to buy a new laptop that’s spillproof, rainproof, dustproof and drop-proof. It’s fanless, it’s silent and it weighs 3.2 pounds. One battery charge will power six hours of heavy activity, or 24 hours of reading. The laptop has a built-in video camera, microphone, memory-card slot, graphics tablet, game-pad controllers and a screen that rotates into a tablet configuration. And this laptop will cost $200. The computer, if you hadn’t already guessed, is the fabled “$100 laptop” that’s been igniting hype and controversy for three years. It’s an effort by One Laptop Per Child (laptop.org) to develop a very low-cost, high-potential, extremely rugged computer for the two billion educationally underserved children in poor countries. The concept: if a machine is designed smartly enough, without the bloat of standard laptops, and sold in large enough quantities, the price can be brought way, way down. Maybe not down to $100, as O.L.P.C. originally hoped, but low enough for developing countries to afford millions of them — one per child. XO is a technological tour de force. Of course, XO has its detractors. Gearheads complain that it’s underpowered and fully functioning laptops can be purchased for $400 today. As Pogue points out, missing the point entirely. It’s not for you, guys. And, ministers of education (and their superiors, I’m betting) in many developing nations apparently feel threatened by the implications of such an interconnected, and Internet-connected, resource in so many millions of hands. I hope that every child in the developing world get’s a chance to use the XO — and as I’ve stated here before, a lot of U.S. kids live in developing world conditions as far as housing and education are concerned. And, based on what we’ve all seen of the value of the dollar lately, $188 is the new $100. 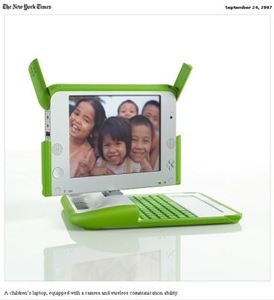 So, don’t beat up OLPC on price — ramp up production and watch what happens. And if it doesn’t, based on Pogue’s evaluation, it’s a dazzler even at today’s price. And imagine some of the older children tuning into UC Berkeley’s YouTube courses. This all can’t happen soon enough. And, you can help! This is a wonderful cause, and I would think that people who would find a $399 purchase with a 50% charitable component affordable might also wish, as the story suggests, to donate the PC they’re entitled to a (not third world, but certainly third rate) school in this country. God knows that there are pockets of the third world within these preciously regarded borders of ours, many within our biggest cities. Then it becomes a $399 charitable contribution, serving to further education among the deserving needy in our own country as well as beyond…. … Despite all the obstacles and doubters, O.L.P.C. has come up with a laptop that’s tough and simple enough for hot, humid, dusty locales; cool enough to keep young minds engaged, both at school and at home; and open, flexible and collaborative enough to support a million different teaching and learning styles. This entry was posted on Friday, October 5th, 2007 at 5:06 pm and is filed under Education, Geopolitics, musings, Technology. You can follow any responses to this entry through the RSS 2.0 feed. You can leave a response, or trackback from your own site. This is a really good article loaded with useful information. I enjoyed the read and I agree with most of it. Thank you for sharing.